The name translates to precisely what you think it means: ‘brigadier,’ and for a good reason. It so happens that the candy is named after Brigadeiro Eduardo Gomes, who was not only a high-ranking official in the Brazilian Air Force, but something of a revolutionary sort. After WWII, Gomes ran for office, but thought that he could get elected on his good looks and charm alone, especially now that women in Brazil had just gained the right to vote. There are variations to the story on whether he was married or single at the time, of course, but the point is, he used his looks, rather than his politics to get into office. He found out that he couldn’t win the presidency on his looks alone, but ironically, he still sort of won by having a candy named after him and his good looks. This traditional Brazilian food is deceptively simple. It consists primarily of butter, condensed milk and cocoa powder, cooked over medium-low heat in a skillet (preferably non-stick) to a thick consistency, and then rolled into balls and coated with chocolate sprinkles, or other small coatings such as pistachios, coconut, almonds or any other crushable topping that would complement chocolate fudge. The deceptive part is getting the right consistency. The idea is to cook the three ingredients down to a certain thickness so that the chocolate comes away from the bottom of the pan, and it has to be stirred constantly, since it contains milk, and milk has a tendency to scorch if left to sit in a heated pan too long, even on medium-low heat. So, once you have your chocolate to the right consistency, empty the pan onto a plate to cool enough so that you can roll it into balls. Grease your hands with unsalted butter (this keeps the chocolate from sticking to your hands), and start rolling the chocolate into small balls, then coat each chocolate ball in whatever topping(s) you’ve decided to use, and place them in little paper cups. Alternatively, if you don’t quite manage to get the chocolate to the right consistency, it’s just as good eaten while warm: it can be piped into small shot glasses to be eaten with a spoon. Cocoa powder, butter and condensed milk comprises the simple recipe, of course, rooted in the lean years of WWII, when Brazilian women had to make do with what they had. But as the years have gone by, gourmet pastry chefs have taken the brigadeiro to a new level, introducing fruits, alcoholic beverages such as and other variations on the theme. There is even a brigadeiro shop in Los Angeles that uses red and green sprinkles for Christmas and blue and white for Hanukkah, along with other custom flavours and toppings, in addition to classic Brazilian flavour staples. 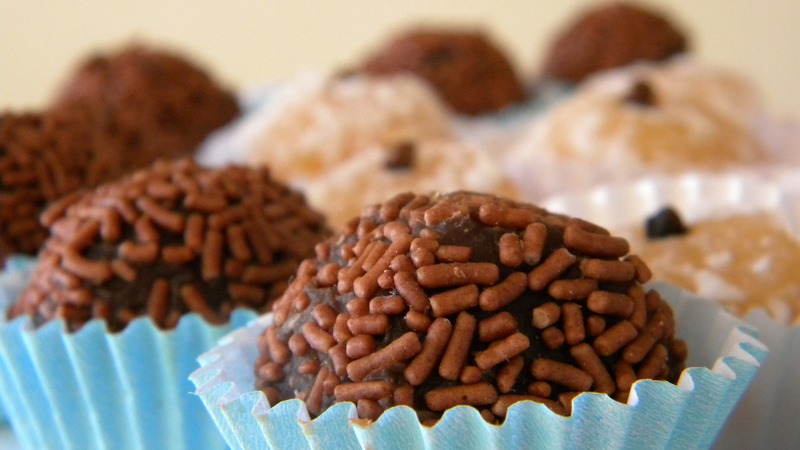 So whether you try your hand at making brigadeiro yourself, or you order it from a custom candy store, you’ll be amazed at the delicious flavour and ways that this favourite Brazilian candy can be made, whether you go for the classic recipe, or something a bit more dramatic.